The Rickys team is celebrating after being awarded another Chef Hat in the 2017 Good Food Awards on the 18th of July. The Good Food Guide 2016 Awards have celebrated the very best of Victoria’s, New South Wales’ and Queensland’s exceptional culinary scene. The awards ceremony recognises the best restaurants, the people’s favourites, rising talents, culinary contribution, dining diversity and the friendly, authentic experiences that place Australia firmly on the global food stage. We want to thank our hard working team, and the diners who continue to support us, and inspire us to grow. We are so excited to receive one of nine hats awarded to restaurants on the Sunshine Coast, with our friends at Locale also receiving a hat. The Chef Hat came with a review that made special mention of our wine list, and we would love to share it with you. Elegant modern dining in a light-filled space by the water. 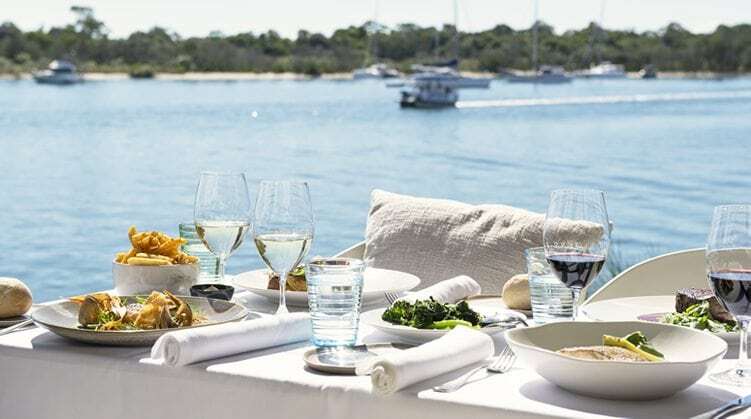 A stunning vista across the water where paddle-boarders and kayakers drift past, are matched with a good-looking list of wines and the kind of dishes that celebrate the simple integrity of great produce in beautiful combinations. A cool burrata comes drizzled with a verdant basil oil, sitting in a circle of artfully draped pickled zucchini strips with red oak leaves and candied walnuts. A lamb dish of tender backstrap and crumbed cube of belly displays technique and heart, with carrot puree and a mustard vinaigrette. The seafood choices are excellent too, from grilled local squid stuffed with botifarra sausage to Coral Coast barramundi with charred corn and pardon pepper relish. Honey crème brulee, its toffee shards upright like yacht sails, is put with blood orange gel, buttermilk sorbet and almond crumb. A dessert worthy of diverting our eyes from the view one last time. This is food that nails the hat-trick of great sourcing, technique and playfulness.